Boasting a prestigious location in the heart of the City of London, 85 London Wall is in short walking distance to Liverpool Street and Moorgate Station area, which is home to financial, legal and professional companies as well as an excellent range of shops and restaurants. 85 London Wall offers approximately 34,000 sq ft of office space over five floors. 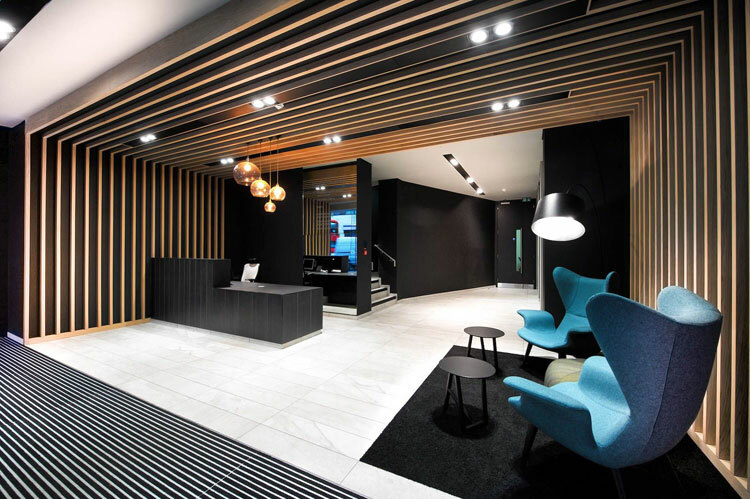 Last refurbished in 2009, the reception area has recently undergone a dramatic hi-spec revamp, creating a dramatic scheme using darker colours and wooden finishes. The new lighting scheme is subtle, almost invisible, allowing the textures and materials in the space to take the centre stage. Approached by the interior designers at Generate Studio in February 2017 with a design concept, 299 Lighting have been working closely with their team by providing support with product specification, full lighting design, calculations and working samples. Clean aesthetics achieved through concealed lighting that would blend into the feature timber construction. To achieve this design brief, the Hunter Flex system from Intra lighting was specified. Several Hunter Flex profiles in 6m and 4.8m length with a mix of blank sections and LED spots have been used to achieve the desired effect. The 100 mm wide Hunter Flex profile sits inside the timber rafts. To keep the design uniform, some profiles have been recessed into the plasterboard in the main reception and circulation areas. The Hunter flex is a flexible linear lighting system offering the designer the freedom of adding lit and blank modules, adjustable single or double spots, loudspeaker covers or even diffusers for air-conditioning units. It’s a perfect solution for large architectural joinery details. 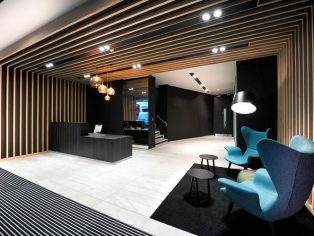 The refurbishment of the reception area was completed over a five week period whilst keeping the area fully operational.